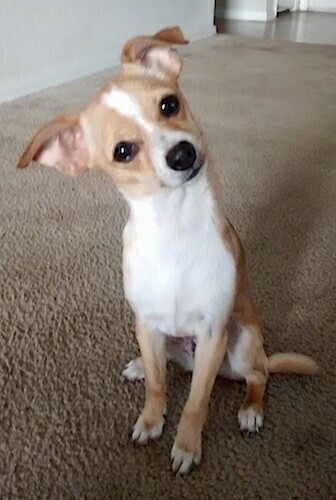 Cici the Jack Chi at 1 years old—"Cici is the love of my life. 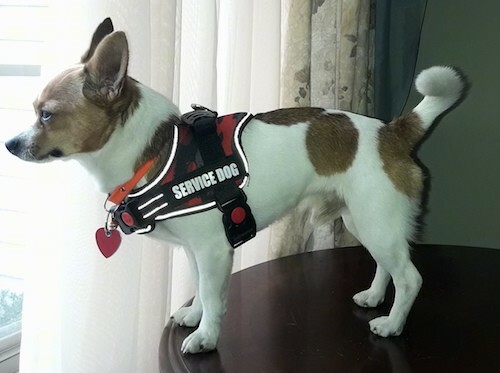 She is smart, well-trained, loving and great with kids... xo"
The Jack Chi is not a purebred dog. It is a cross between the Chihuahua and the Jack Russell Terrier. The best way to determine the temperament of a mixed breed is to look up all breeds in the cross and know you can get any combination of any of the characteristics found in either breed. Not all of these designer hybrid dogs being bred are 50% purebred to 50% purebred. It is very common for breeders to breed multi-generation crosses. 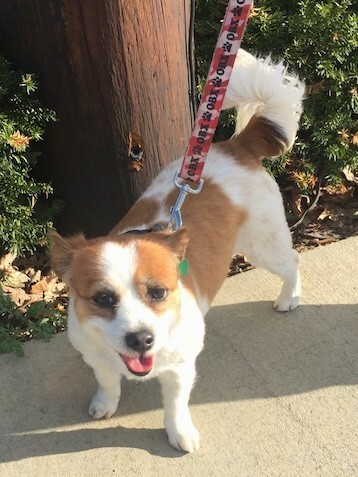 Ellie the Jack Chi at 5 years old—"Ellie's a 5-year old Jack Chi, and we're pretty sure she's a cat trapped in a dog's body given the contrast between her usually ultra-mellow demeanor and her attitude and sass when she gets feisty. 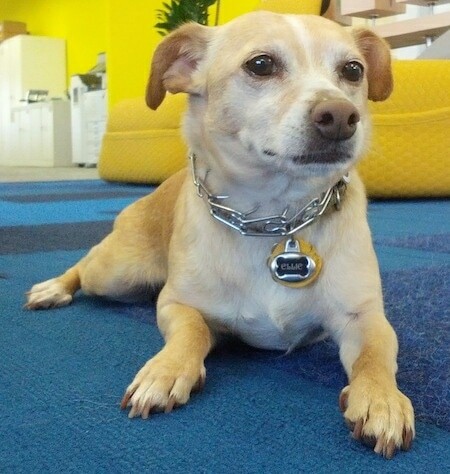 She hangs out at the Google office frequently where she loves getting belly rubs and playing with our other G-dogs (Marco & Moose). She's a rescue dog and we truly hit the jackpot with her; couldn't ask for a better addition to our family!" "I have a Jack Chi I rescued from a terminally ill neighbor. I like cats and didn't like dogs until I met this determined dog. He selected me. This dog would not leave me alone when I visited my friend, until he made me be his friend. He would not take no for an answer. I started taking him on walks because my friend hardly had him outside. Then my friend continued complaining she needed a break from him. She said her aide kept promising to take him for a few days, yet never did. Finally one day when she was complaining, I asked her if she wanted me to take him for a couple of days, I did, then she didn't want him back. Finally one day she said, "I will sell him to you for $100". I replied, "Will you put it in writing and give a receipt?" she said, "No problem" and now I have had him a year. He had no vaccinations or vet checks, so that was first thing I did. He weighed 5.8 pounds and had diarrhea. So he got his shots including rabies, had the meds to eliminate the parasites and then heartworm. He now weighs almost 8 lbs. He is very Intelligent and highly active, yet he loves to follow me everywhere and lays down with me if I lay down. He LOVES everybody. Is gentle with children. Has a keen sense of smell and likes to smell everything. Any time i eat anything. He has a need to jump in my lap afterwards or while I'm eating so he can get a sniff of my breath. He doesn't want the food ... but wants to smell it. He is very smell driven and of course LOVES to tree squirrels. He is usually very good and compliant. I was taking him with me everywhere in all the stores and no one said anything at all in objection, then I found out it is illegal for any dog except service dogs to go in any business where food is sold. So I can't take him much anymore, but he is allowed to go to the doctors with me and they tell me he is so well behaved that he is welcome anytime. I truly love this dog and think he is a fine specimen for the Jack Chi mix. He is an adventurous, high energy, inquisitive, charming dog." "This is Bojangles aka Bo-Bo. We have recently adopted him from the humane society. He is one of the best dogs I can hope for. He hardly barks unless he sees a cat or someone he does not know. The only thing he chews is his little chew toy and he responds to a special noise I make as a "come here" signal. His speed surprised me the first time. His leash slipped out of my hand when chasing a cat and it was a hassle trying to catch up, even though he stopped when the cat went into the woods. We recently bought a Chihuahua puppy and after a while of playing tough love, Bo-Bo came to accept and act as a parent figure to our little Onyx. He is a wonderful family member."